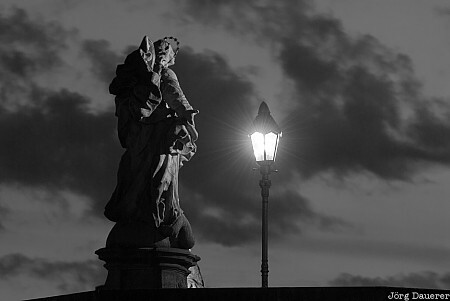 A statue and a street lamp on Alte Mainbrücke (an old bridge crossing the River Main) in downtown Würzburg after sunset. Würzburg the capital of Unterfranken in northern Bavaria, Germany. This photo was taken in the evening of a sunny day in May of 2010. This photo was taken with a digital camera.